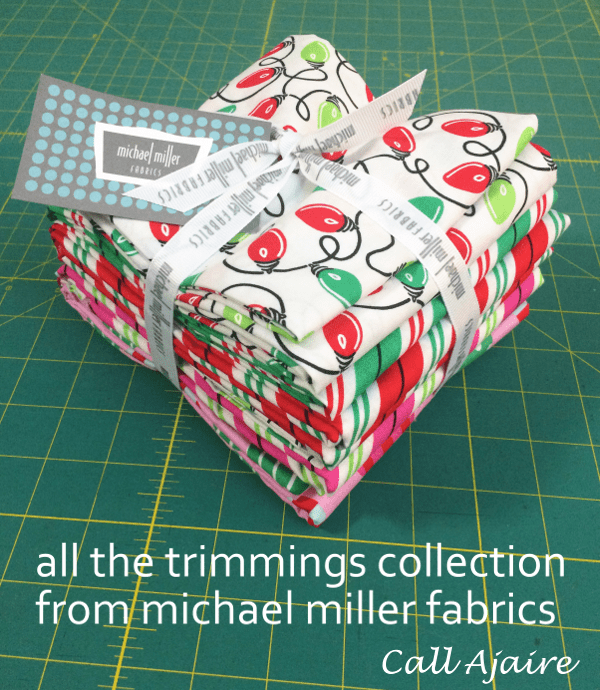 There’s nothing more fun to sew with than Christmas fabrics and Michael Miller’s All the Trimmings line is no exception. 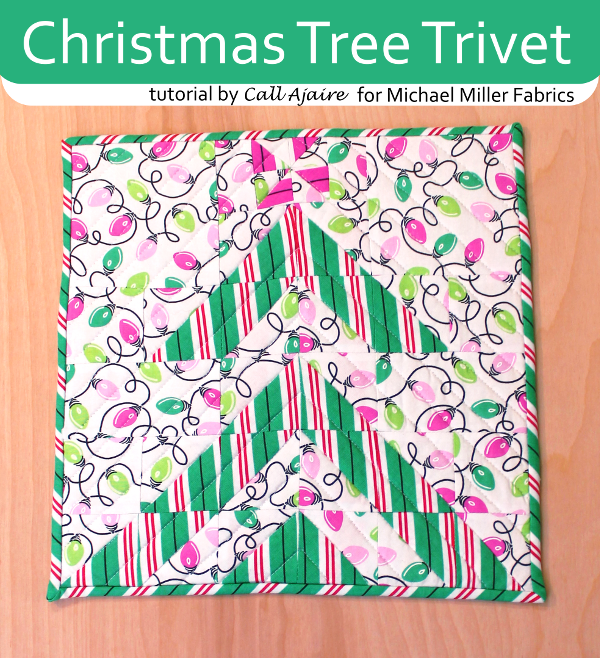 Here’s a tutorial for making your own Christmas Tree Trivet which is a perfect project for using those holiday fabrics. Michael Miller sent me the fabric for this post, but as always ALL opinions are mine. 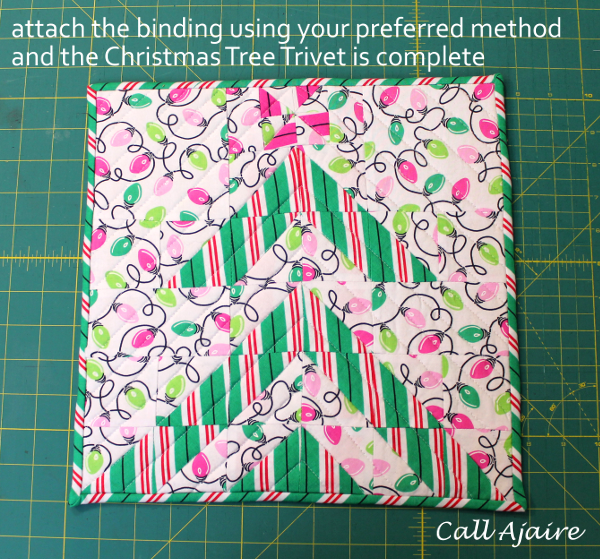 The Christmas Tree Trivet top is a 12″ quilt block so you can use it for any project that requires a 12″ block. This quilt block is made up of mostly half square triangles (HSTs) and I’ve already done the math for you to make it simple. My preferred method for making HSTs makes four at once which really speeds things along. 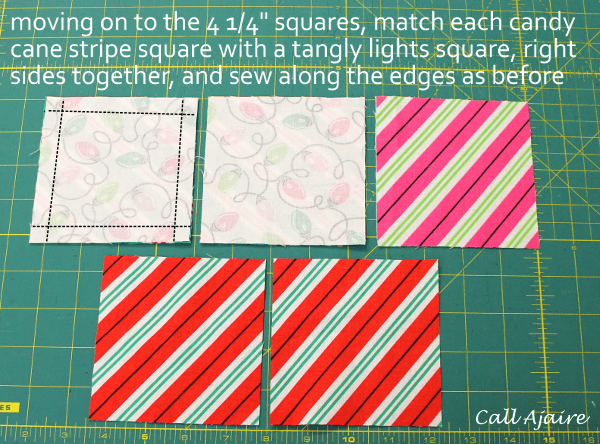 I’ll walk you through the steps below, but for a quick overview the (5) 4 1/4″ Green Candy Cane Stripe squares will be sewn to the (5) 4 1/4″ Tangly Lights squares to make (20) 2 1/2″ HSTs and the 2 5/8″ Pink Candy Cane Stripe square will be sewn to the 2 5/8″ Tangly Lights square to make (4) 1 1/4″ HSTs. I have made a few of these so far so don’t be thrown off by the different colored fabrics in the tutorial below. Start by sewing the HSTs for the star. 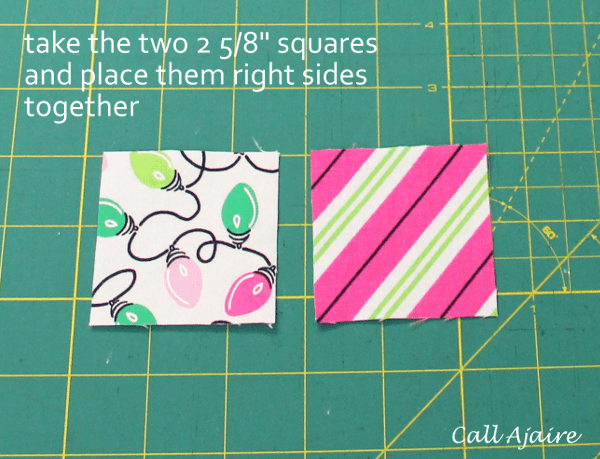 Take the two 2 5/8″ squares and place them right sides together. Sew together with a 1/4″ seam allowance along one side. 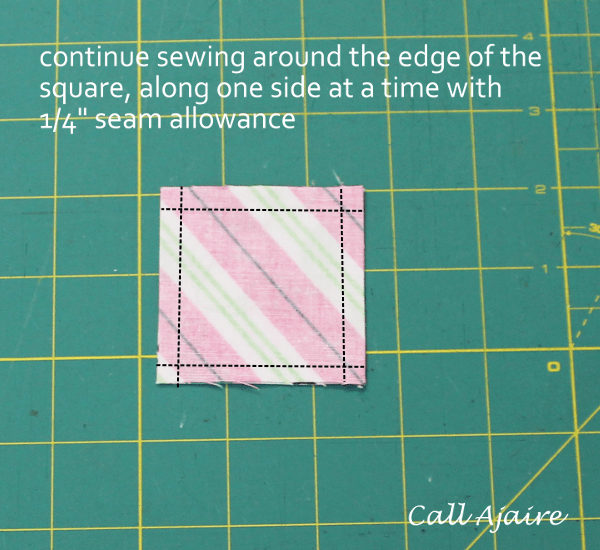 Continue sewing around each of the edges using 1/4″ seam allowance. You can sew a square all at once by pivoting around the corners at a 1/4″ seam allowance instead of sewing in four different steps and if you look closely at the picture below you can see that’s how I sewed this particular one, but I find it more accurate to start each edge at the 1/4″ mark on my machine instead of pivoting. It also makes it easy to speed piece which will make more sense when we work on the tree HSTs. 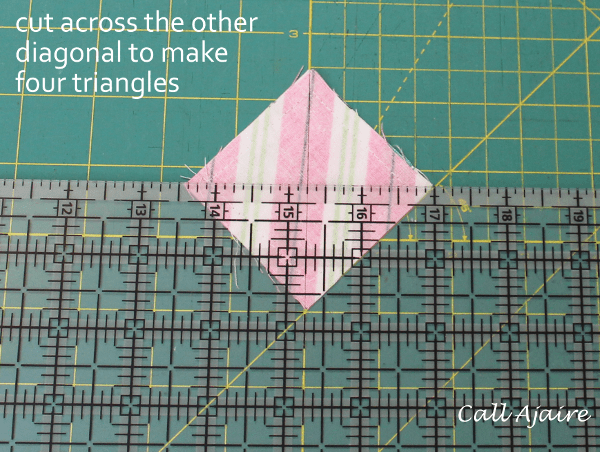 Once all the sides have been sewn, use a rotary cutter and ruler to cut the square across the diagonal into two triangles. Then cut across the other diagonal which will result in four triangles. 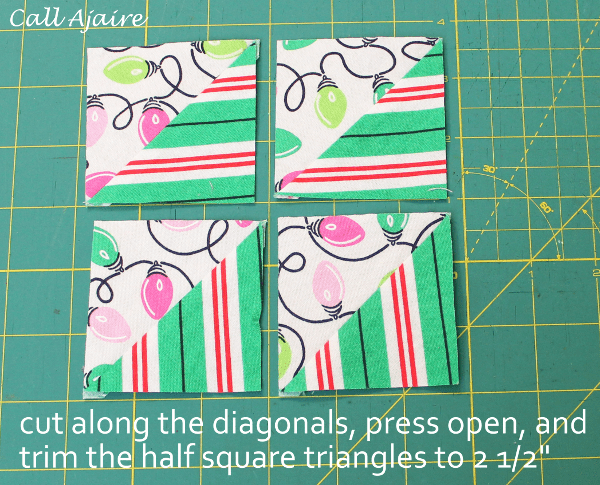 Press the HSTs open with an iron and if necessary trim the four squares to 1 1/2″. 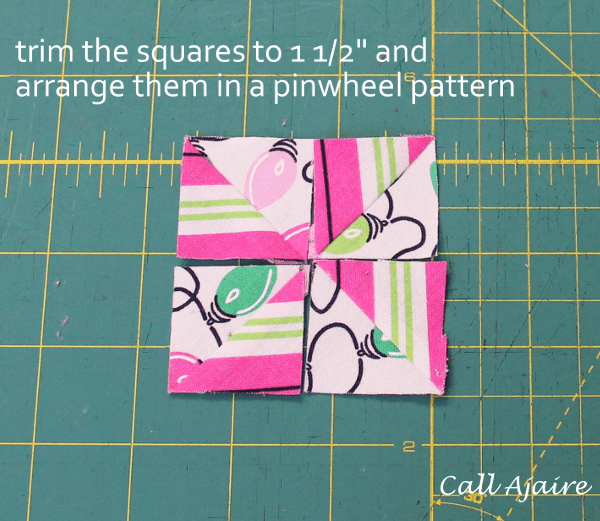 See how quickly you sewed four HSTs? 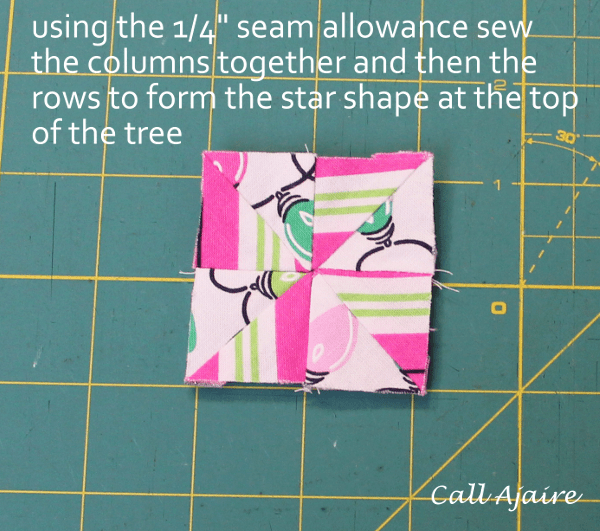 Arrange the four HSTs in a pinwheel shape to form the star for the top of the tree. Using 1/4″ seam allowance sew the pieces together, columns first and then the row. Now we move on to the five larger square pairs. 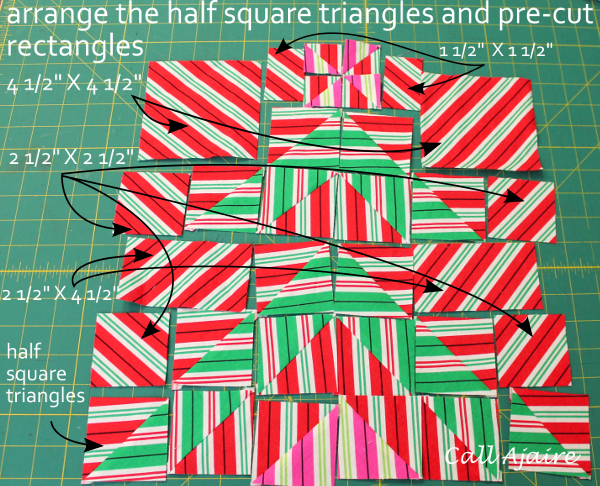 As with the star HSTs, these tree HSTs are sewn with the Green Candy Cane Stripe squares right sides together with the Tangly Lights squares. 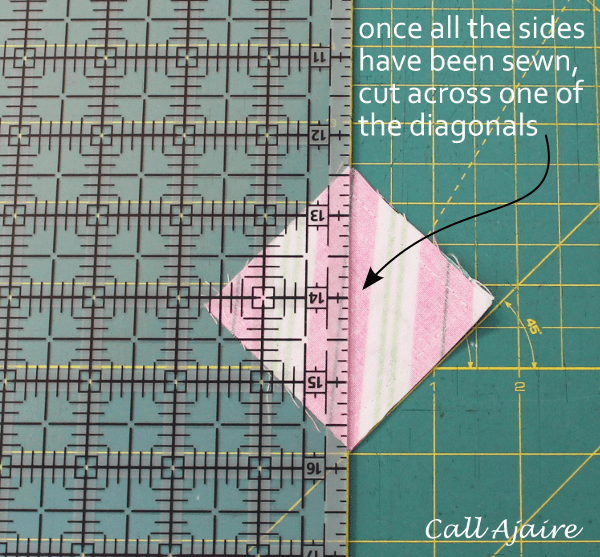 If you line up all five of the 4 1/4″ square pairs at your sewing machine, you can sew one side of each of the pairs assembly line style, trim the threads in between, and then move onto the next side of each of the squares, repeating until all four sides of each of the squares has been sewn. 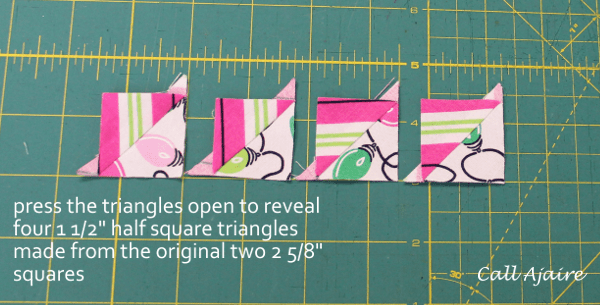 Cut the squares along the two diagonals as before, press the HSTs open, and trim all 20 of the HSTs to 2 1/2″. We will not be using 2 of the 20 HSTs so set those aside for another project. The HSTs have been sewn so now we just need to assemble the quilt block. We’ve already sewn the star pieces together (in the picture above they are haven’t been sewn yet), so arrange the tree HSTs and the rest of the cut list rectangles and squares as shown above. Sew the pieces together using 1/4″ seam allowance and working across the rows and then down the columns. 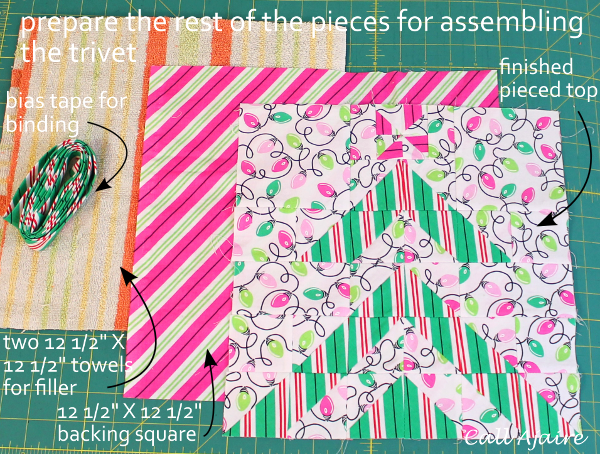 The finished trivet top square will be quilted with the 12 1/2″ Pink Candy Cane Stripes square as a backing and two towels or batting acting as filler in the quilt sandwich. Make sure to press all of the pieces well before assembling. 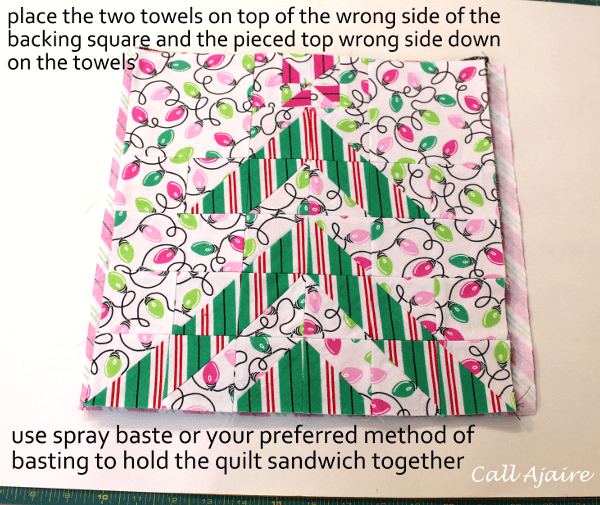 With the right side of the Pink Candy Cane Stripes square down, place the two towels on top, and the tree square right side up to complete the sandwich. I used spray baste to hold the layers together, but feel free to use your preferred method. Quilt through all layers to secure it together. I followed the lines of the tree, but a fun free-motion swirl would look great with those Tangly Lights too. All that is left to complete the trivet is to sew the binding to the edge. I sew the binding to the front, mitering the corners as I go, flip and press the binding to the back, and hand stitch the binding down once everything is fully pressed. 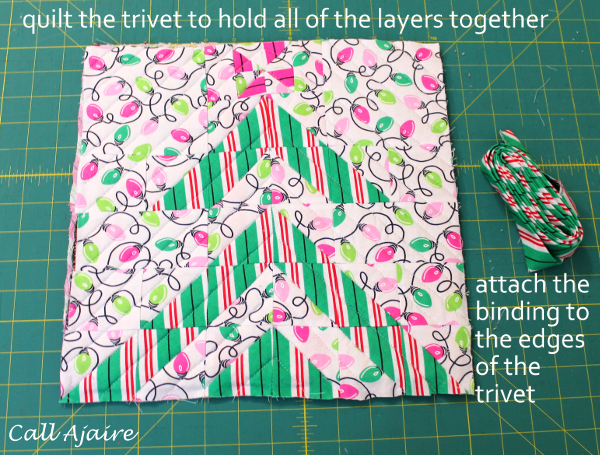 No matter how you like to bind your edges, the result will be a fun and festive Christmas Tree Trivet to use or give for the holidays! I’d love to see yours if you make one so feel free to post some pics on the Call Ajaire FB group!